I know how many of you have already crinkled up your noses in disgust at the mere mention of Brussels Sprouts. I know, because I am pretty sure my own mother is one of you. On my never ending mission to entice you all into becoming L-O-V-E-R-S of these silly little mini cabbages, (ahem, remember such dishes as Brussels Sprouts Pesto, Brussels Sprouts Pizza, Brussels Sprouts Hash and Chocolate covered Brussels Sprouts? Just kidding about the last one) I have a new one. Not shockingly it involves Bacon. Lots of great things do, don’t they? But also sweet red onions, and very importantly, creamy chunks of Avocado. This is a great variation on the old standard for Thanksgiving. Now you will have to pardon me and the city I live in, which is so dang dark all the sudden I can barely handle it. The day I took these pictures, it was so dark in my kitchen by 3 pm that I wondered if I had been transported, house and all to Alaska. Then I remembered that is just the deal around here at this time of year and for the next 5 months. Awesome. So long whiney story short- there are no step by steps. It was just too dark. But you guys are awesomely great cooks right? And there are detailed instructions- so don’t worry! 3. Add 2 teaspoons olive oil and the Brussels sprouts. Cook the sprouts on high heat for about 2 minutes until starting to brown and the pan is drying up. Add the chicken stock. 6. Mix together the olive oil and the balsamic vinegar and drizzle over the top of the dish. Serve warm. Loooove this! I just made something very similar last week. Avocado and bacon are my life. Well, if you’re going to put bacon on it….. Loved this recipe!! Thank u!! Hmmm, I’m thinking this will be on my dinner table tonight. Now I just have to figure out what to have with it! 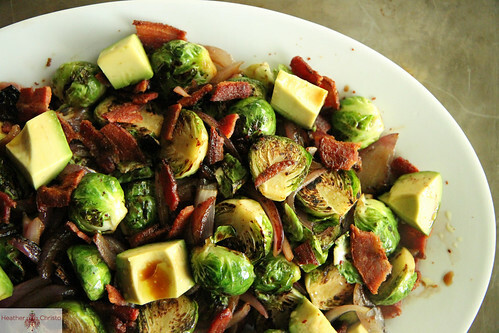 Love brussel sprouts! I used an IPA instead of Chicken stock. Superb outcome! Thank you! I could eat the whole pan! Well I LOVE brussels sprouts, so keep ’em coming! I haven’t been able to convert my parents yet tho. Maybe this recipe will do the trick! Wow, great choice to put the avocado in with the sprouts, flavor extravaganza!!! Literally ALL of my favorites in one side dish!! 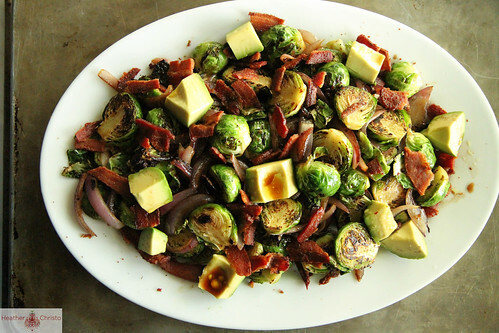 I love Brussels Sprouts so this dish would be a big hit in my house! 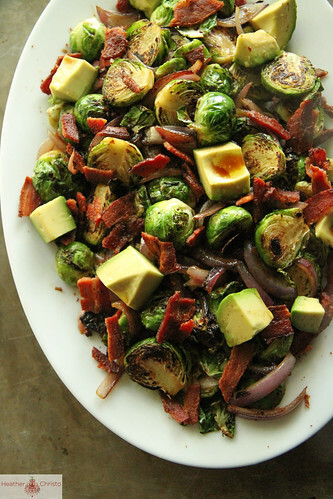 The bacon, red onion, and avocado are perfect in this this! Bring on the brussels! And the bacon. And the avocado. Basically, just bring me this dish. Lol. 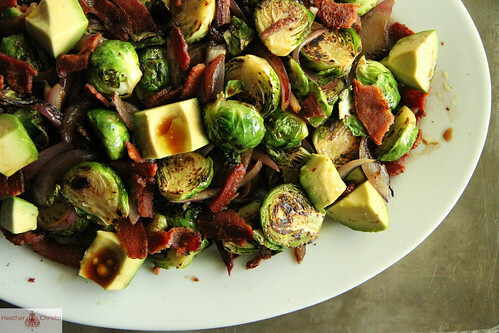 this recipe showed up in Susan’s timeline a couple of days ago and we immediately thought it sounded worth trying (we both love brussels and avocados, who doesn’t love bacon, and almost everything I cook starts with onions). I made it last night. Was super tasty, definitely going to be making this again, and often. I used frozen brussel sprouts which seemed to work out fine. Made more sense to get frozen Canadian ones when the “fresh” ones came from Guatemala? (We live in eastern Ontario). I’ve finally discovered a brussel sprouts recipe that makes them taste good! So glad I saw this post on Facebook. This is going into the recipe rotation for Thanksgiving. What balsamic vinegar do you recommend? Shoot Cathy- I am so sorry I am not sure!